Progress has been made on the helmets. 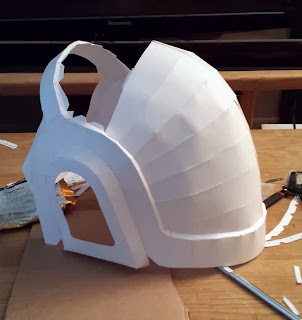 As mentioned in the introductory post, the first steps were to create full-size paper versions of each helmet and then reinforce them with fiberglass. I've been following some guidelines put out by a few sites like this one. The idea behind papercraft is that you can create a folded-paper version of a 3D model that has been designed on a computer. There is software that takes imported 3D models and splits up the geometric faces into pieces that can be cut out from paper and glued back together to re-form the 3D shape. This software outputs a series of 8.5"x11" images that are printed to cardstock. 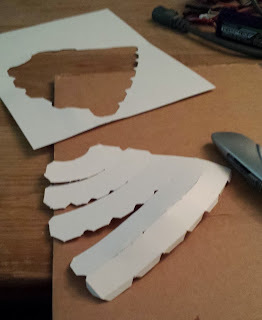 In order to connect the various 2D pieces together to form the 3D shape, the software adds on flaps and fold lines to instruct what pieces need to be glued where. 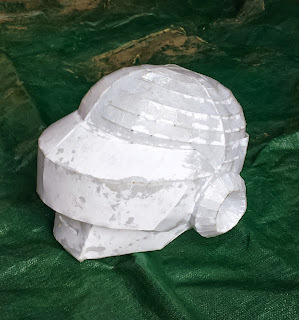 After finding nice-looking 3D models of the helmets on the internet, I set out to print, cut, and glue. I didn't have access to a printer that could handle cardstock, so instead I just printed to normal copy paper and glued each sheet to a piece of cardstock. Hints of a 3D structure. The whole papercraft ordeal seemed daunting at first, but then I realized it was 1am, had just spend 6 hours gluing my fingers together, and had no intention of stopping. When I got busy cutting and assembling (with the help of a friend) I noticed it wasn't as bad as I had anticipated; the mindless work was actually a little addicting. Went through a few X-acto blades. Hoping I can fix slight lumps later..
Each helmet ended up needing about 6 hours of work. I was very happy with the final product, even if my occasional sloppiness in cutting caused some unwanted lumps on the helmets. Both helmets were lightweight, but still able to support their own shape. The next step was to reinforce the helmets with fiberglass. Fiberglass is a strong, lightweight material that is made of two components: resin (glue-like stuff) and fiberglass cloth (a cloth that is made of bits of glass). If handling a cloth made of glass shards sounds like a bad idea to you, then you are a reasonable person. Don't let the stuff touch your skin. I've made this mistake when installing insulating wrap on motorcycle exhaust pipes and had to cover my hands with duct tape in an attempt to pull the tiny glass fibers out of my skin. Also, the resin comes in two parts that are mixed together to initiate curing (hardening/drying). This is an exothermic reaction (gives off heat) and it can really heat things up. A thin coating of the stuff probably won't heat up noticeably, but a cup of the stuff can start to smoke and will burn your hand if you hold it. In all, don't try to make fiberglass things unless you are familiar with the hazards. Do it outside, wear protective gear, etc. 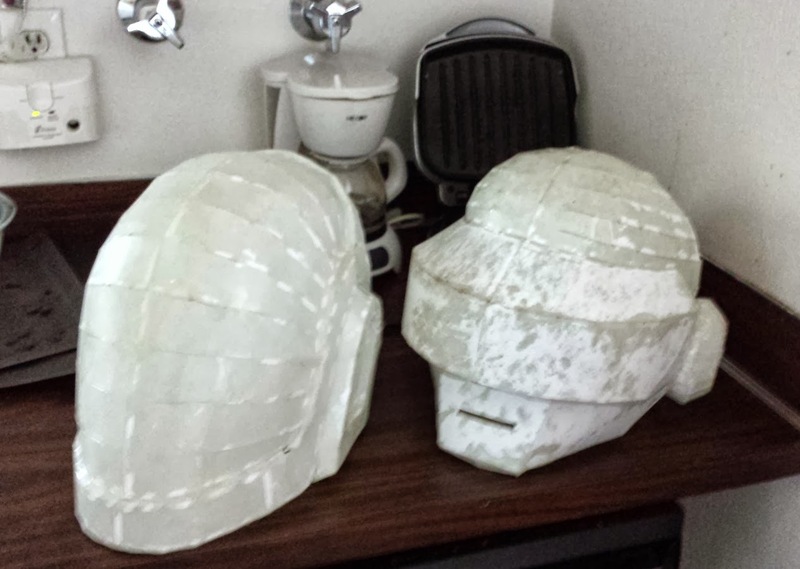 The first step in reinforcing the helmets is to coat the inside of them with a thin layer of resin. I mixed the two parts together in a mixing cup and used a cheap paintbrush to coat each helmet. Outside looks wet due to the epoxy from the inside seeping through. Once the helmets were thoroughly coated I let them dry in an outdoor closet. After a day they were much stiffer than before, but still not robust. This first coat of resin was primarily to ensure the paper helmet doesn't fall apart or warp during the application of fiberglass cloth. To efficiently apply the fiberglass cloth to the inside of the helmets, I cut a large sheet into smaller strips (about 3"x1") and coated the inside of the helmets again with a thin layer of resin for stickiness. 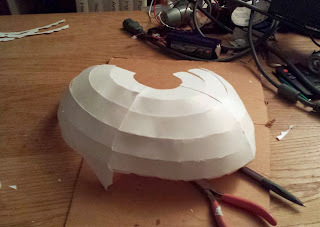 I would place 4 or 5 overlapping strips inside the helmet, then dab more resin on top until they looked soaked. I found that my resin would start to harden in the mixing cup after 10 or so minutes, so I made small batches in order to not waste materials. After being left alone for another day or two to cure, the fiberglass was hard as rock. My rough estimate is that each could withstand having about 40 pounds placed on top before buckling. Don't blame me if you try this and they collapse with less than that. I'm certainly not going to put my beloved helmets to the test. The next step we be to coat the outside in Bondo (or similar) and sand it down to fine-tune the shape.